WASHINGTON (AP) — With his father looking on, President Bush on Thursday signed legislation expanding the protections afforded by the landmark Americans with Disabilities Act to those who can use medication or other devices to treat impairments. Passed in the House by a vote of 402:17 on June 25! Passed in the Senate by unanimous consent on Sept. 11! 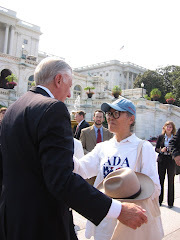 Yoshiko Dart, holding the late Justin Dart’s signature hat, greets Majority Leader Steny Hoyer (MD-5) before the press conference begins. 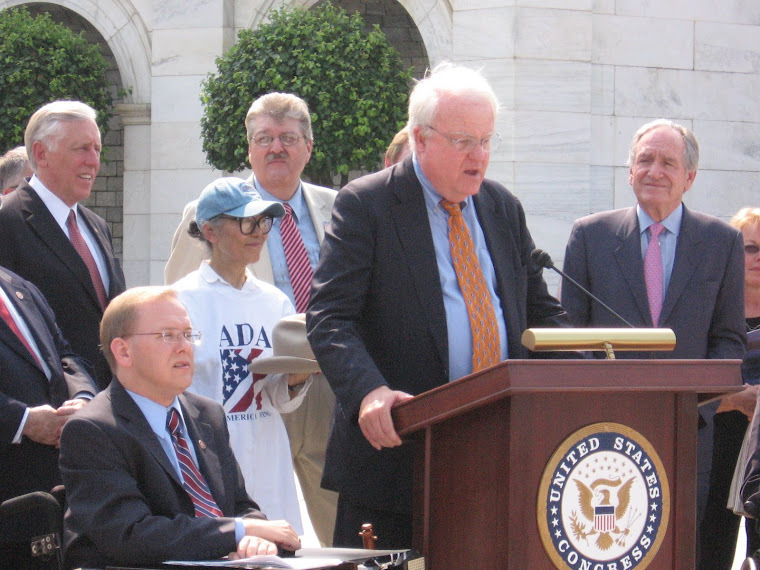 Rep. James Sensenbrenner (R-WI) stands at the podium: “Today, we want to place the ADA rightly back among our Nation’s great civil rights laws.” From left to right, Rep. Steny Hoyer (D-MD) upper far left, Rep. Jim Langevin (D-RI) bottom foreground, Yoshiko Dart in baseball cap, Rep. Jim Sensenbrenner (R-WI) at the podium, Sen. Tom Harkin (D-IA) far right. ...with liberty and justice for ALL!